The reality is that you can never stand on a level surface in a boat that is 6 foot long unless your center of gravity is in the exact center. Anywhere beyond results in a deck tilted towards the water in that direction. The further you step from the center the softer and more sensitive the free board becomes. 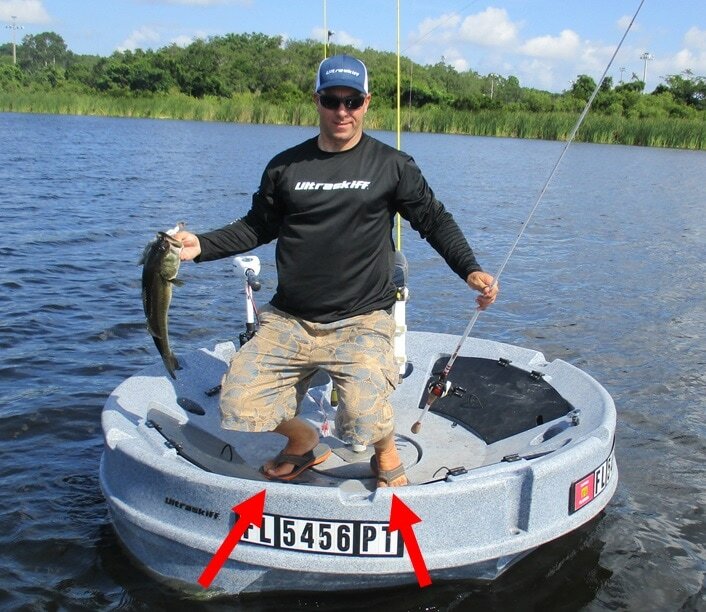 It is that simple science that led to the design of the Ultraskiff 360. The Ultraskiff combats this sensitivity by raising the height of your toes thereby limiting the movement of the users Center of Gravity. ​Our patented design has an outer deck/inner hull angled on a gradient. ​The design places the Center of Gravity of the boat and the occupant in a lower position since a significant portion of the buoyancy is contained above and around the occupant. 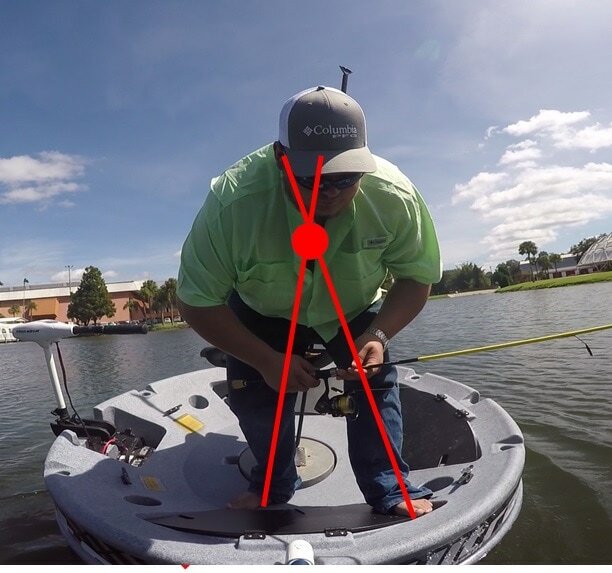 Whenever you stand up in front of your chair in the Ultraskiff and your feet cross the incline, you are standing uphill with your feet directed towards the center of the boat. If you only had a flat surface to stand on, you would always be standing downhill, flatfooted towards the water. Whenever you kneel down in front of your chair in the Ultraskiff, you are kneeling uphill. The same way a fish pulled over the gunwales slides to the center, so does your weight when pressed against the gradient surface of our watercraft. This funnel effect helps a lot when exiting and entering the craft. Standing up is an exercise you can accomplish with less focus and effort if there is a surface where your toes can grip onto and exert outward pressure. ​Ensuring that the effort you put into rising from a kneeling position results with you in your chair. In the Ultraskiff, outward pressure from your feet is an ability afforded ALL occupants, tall or short, children or adults, by allowing the user of the vessel to choose a pedestal length that enables their feet to touch the supportive gradient surface. The shock absorbers in the detachable pedestal mount allow the fulcrum of the seat pedestal to shift and flex independently from the hull. Because the person sitting in the chair weighs more than the hull itself, it allows the boat to bounce in choppy water without feeling every single small shift. So when you lean over in your chair the rest of the vessel is not immediately shifted with it. There was no better test of this then when we took the boats 30 miles offshore to use them as fighting chairs. Watch this video for a demonstration.